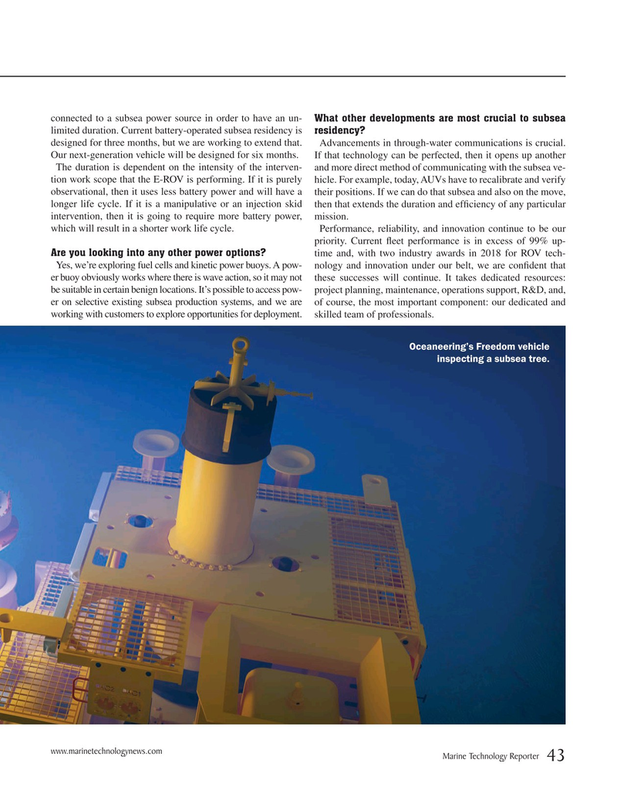 connected to a subsea power source in order to have an un- What other developments are most crucial to subsea limited duration. Current battery-operated subsea residency is residency? designed for three months, but we are working to extend that. Advancements in through-water communications is crucial. The duration is dependent on the intensity of the interven- and more direct method of communicating with the subsea ve- tion work scope that the E-ROV is performing. If it is purely hicle. For example, today, AUVs have to recalibrate and verify observational, then it uses less battery power and will have a their positions. If we can do that subsea and also on the move, longer life cycle. If it is a manipulative or an injection skid then that extends the duration and ef? ciency of any particular intervention, then it is going to require more battery power, mission. Yes, we’re exploring fuel cells and kinetic power buoys. A pow- nology and innovation under our belt, we are con? dent that er buoy obviously works where there is wave action, so it may not these successes will continue. It takes dedicated resources: be suitable in certain benign locations. It’s possible to access pow- project planning, maintenance, operations support, R&D, and, er on selective existing subsea production systems, and we are of course, the most important component: our dedicated and working with customers to explore opportunities for deployment. skilled team of professionals. Oceaneering’s Freedom vehicle inspecting a subsea tree.